Emineke against any of USA LBs = disaster for the USA. Jordan obviously rooting for B-H, not even close to a foul. Poor poor defending. Michael Babatunde is cleared by Emir Spahic... and Asmir Begovic makes a low save! That foul qualifies as a foul only in Basketball, this is football. Bosnia-Herzegovina now look ponderous in possession - those decisions have rocked their confidence, and they need a talking-to at half-time. Emenike is basically doing whatever he wants on that right flank right now. Uhh FBT, the US beat Emenike and Nigeria a few weeks ago. Haris Medunjanin works an opening and shoots from 30 yards, but the ball flies a couple of yards wide. Nothing doing. That friendly wasn't real competition. From that angle it looked like the Nigerian player pulled him back a little and clipped the Bosnian's foot. I've seen them given. 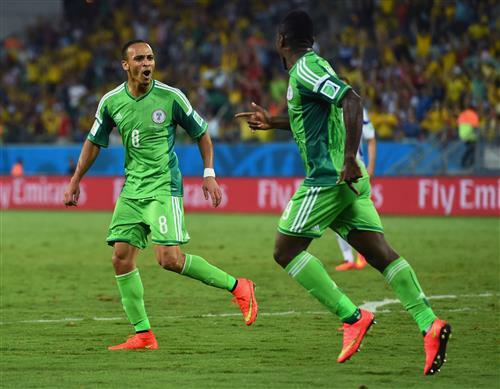 Joy for Peter Odemwingie as he celebrates with Emmanuel Emenike. Five minutes until half-time, and Edin Dzeko loses out to a great challenge by Kenneth Omeruo. Bob, they look like they've been sapped of their energy by that goal. Nigeria want it more. After B-H's last cross was intercepted, their players just walking up the pitch while Nigeria push. Lazy. So I could have gone see Jimmy Buffett today, but watching the World Cup is clearly a higher priority. Alex, you made the right call! Much better urgency from Izet Hajrovic as he drives from his own wing to Nigeria's penalty area, but his pass to Edin Dzeko is poor - the striker is not pleased by that at all. Has anyone heard much about the ball this year? I remember in 2010 the ball was a huge part of the story, players unhappy with it and whatnot, but haven't heard anything at all this year, and with the amount of goals I imagine the players love this ball. DJK, I agree - the keepers probably don't like it though! Bosnia-Herzegovina have to start taking these chances - Miralem Pjanic gets away down the right and cuts the ball back sweetly for Edin Dzeko, but he thumps his shot over from 12 yards. @DJK - There was an article about this ball being rougher and therefore a lot easier to control than the jublani. Dzeko again smacks an effort well wide! Nigeria starting to play like they have won the match.Bad idea. AWFUL giveaway. Do they even want to be here?? Really hoping Bosnia brings out Ibisevic to start the 2nd half. Need a second forward up there.